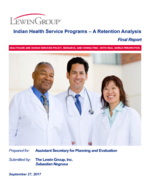 This study expands upon the analysis of the National Health Service Corps (NHSC) begun in “Provider Retention in High Need Areas and continued in “The National Health Service Corps: An Extended Analysis” by using the same techniques used in these earlier studies to examine retention patterns in Indian Health providers.. The study finds about 81% of the IHS program participants serve in the same I/T/U site one year after completion of their service obligation. Their retention in the same site where they practiced while in IHS service remains high in the following years: 75% after 2 years, 65% after 3 years, but drops in the 4th year after obligation completion to about 50%. Some of the IHS participants who stop serving in the same site after obligation completion move to other I/T/U sites, such that the retention of IHS participants in any I/T/U site is, respectively: 90%, 87%, 85% and 76% in each of the 4 years after obligation completion. Retention of program participants is more likely to be higher in sites that offer a larger array of services, and/or are located in more urban or more easily accessible areas.